Product #26730 | SKU MP01978 | 0.0 (no ratings yet) Thanks for your rating! 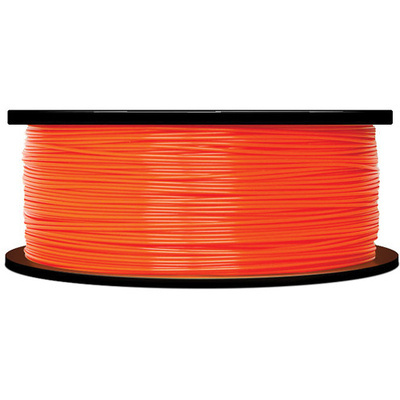 The 1.75mm true orange ABS Filament from MakerBot is designed to work with the MakerBot Replicator 2X and earlier 3D printer models. The MakerBot ABS Filament was comprehensively quality tested at both 100-micron and 200-micron layer resolutions on the MakerBot Replicator 2X. This was to ensure the MakerBot ABS Filament will perform every feature that MakerBot MakerWare software offers with ease. The MakerBot ABS Filament also undergoes long duration testing to ensure that there are no deviances in print quality. Every millimetre of the MakerBot ABS Filament has been subjected to stringent laser testing. With a consistently round diameter, the MakerBot ABS Filament provides high print-quality and consistent flow through the extruder nozzle. The MakerBot ABS Filament adheres well to kapton tape on a heated build-plate, which it requires. Also, your build-plate must be level, clean, and oil-free to ensure the highest quality 3D printing. It is also recommended that you use the MakerBot ABS Filament and your MakerBot 3D printer in a well-ventilated area. The MakerBot ABS Filament can also be used in conjunction with MakerBot Dissolvable Filament (sold separately), which acts as a solid infill material.